If you drive through the neighborhoods in Tuscaloosa’s District 4 where University of Alabama students live you’ll see signs that support candidates who are running for the Tuscaloosa School Board. There are probably some students who have an abiding interest in educating Tuscaloosa’s children. But many of the signs are in dwellings inhabited by Fraternity or Sorority members. They are likely the same people who support the Machine candidates in the Student Government Association races. District 4 has recently been redrawn in a way that gives University students more clout. The 38 percent of students at the University who are Greeks vote as a bloc. The Educate Tuscaloosa Political Action Committee ( ET PAC ) has provided most of the campaign money to three candidates who are running for the School Board. The ET PAC is responsible for the recent mass mailings of postcards in Tuscaloosa that have contained false and misleading attacks on the current board. The Educate Tuscaloosa PAC (ET PAC) was established on April 29, 2013, to support candidates for the city school board. It has had over $60,000 in cash contributions in June, reported more than $43,000 in July and $3,250 in August. The Educate Tuscaloosa PAC has contributed to three candidates running for the school board. Cason Kirby (District 4) whose campaign chest was $15,600 on July 26, derived $14,200 of his contributions from the ET PAC. John Lollar (District 6) reported $9,000 in June and another $5,200 in July from the ET PAC. Renwick Jones (District 7) had $15,020 in July. He received contributions of $9,000 and $5,200 from the ET PAC. All three also received $1,000 from the NUCOR PAC and none or very little other contributions from any other sources. The ET PAC postcards and website have the same P.O. Box 2663 that is found on the campaign materials of Lee Garrison, who is running for the chairman of the Tuscaloosa City Board of Education. Garrison was a product of the University’s Machine when he was elected to the City Council. Mike Echols, the chair of Educate Tuscaloosa PAC, is a member of the Montgomery lobbying firm Franklin Resources Group Board. He has chaired nine statewide PACs based in Tuscaloosa. Five of the nine have used the P.O. Box 2663. Two of his current PACs, T-Town II PAC and Pride II PAC have contributed generously to Lee Garrison’s campaign. Should the ET PAC candidates and Garrison win in the August municipal election it would not be unreasonable to assume that they will be able to control the School Board. Their victory will be in part due to the University Machine vote and to the support by PACs that are tied to Mike Echols who, by the way, is the campaign treasurer for the conservative Republican Governor Bentley. → Is the Chamber calling the shots? 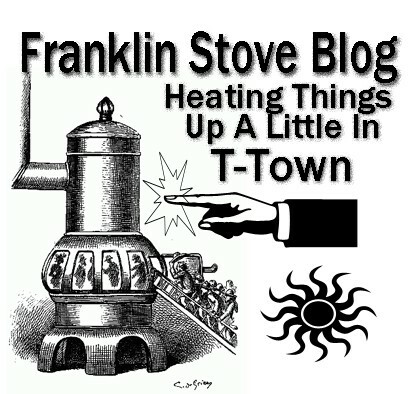 ← Welcome to the hottest blog in in T-Town! Post all yer blogs in the FB group. Awesome. followed by copy stolen from the NYTimes.